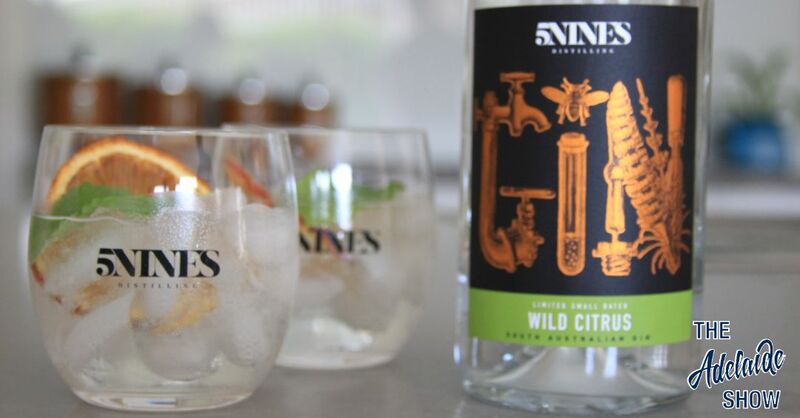 We tasted the 5NINES Wild Citrus Gin on the Adelaide Show 272 thanks to an introduction by our guests for the episode, Tara Tuttle and Rebecca Mezzino. Steve Grigol and David Pearce are the palates behind 5NINES Distilling, and they introduced us to their Wild Citrus gin. The guys dropped in with glasses and mixers and garnish, and gave us a personal tasting. David explained the botannicals in the Wild Citrus gin are heavy on mandarines, limes, and oranges. He said Steve Grigol planted the seed for creating a citrus gin, so they created this one to be a superb summer gin. Steve Davis’ first comment was that on his palate he was getting a refreshing coolness that spritzes over the tongue, bringing a general awareness of gin-ness, but then it’s like sinking back into a citrus bean bag and as you settle and your body heat rises, citrus notes are released and they envelop you. The guys took 18 months to release their first gin because they were trying to perfect the recipe but our suggestion is to not wait that long for trying 5NINES Wild Citrus Gin, available at Arkaba Cellars, West Beach Cellars, and Hutt Street Cellars, as well as on the 5NINES website. You can hear our live tasting in episode 272 of The Adelaide Show Podcast.